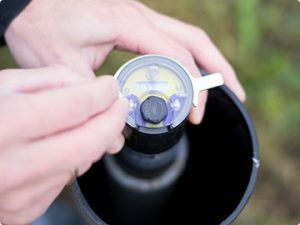 MeetH2O monitors the groundwater level through measuring soundwaves. At locations with high groundwater levels, MeetH2O comes equipped with a pressure sensor. The MeetH2O-D device guarantees accurate measurements, even at very high groundwater levels. MeetH2O-D was extensively tested at various locations and under different conditions. Testing proved successful with MeetH2O-D delivering accurate and reliable data. By using pressure sensors in MeetH2O, the method has become applicable under a wide range of conditions. The costs related to using MeetH2O consist of mobile data subscription costs and costs for data management. A sim-card is included with MeetH2O. Normally, we choose a sim-card with a network that has the best location specific coverage (O2, Vodafone or T-mobile) although it is possible to indicate a preference for a provider online. MeetH2O and the included sim-card will work all over Europe. Data-costs may vary between countries. MeetH2O requires little to no maintenance. Batteries need to be changed every so often. Additionally, we advise to check the groundwater wells regularly. Groundwater levels may be checked manually (with traditional methods) to verify the MeetH2O data. We can perform these regularly verification checks for you. Using our service contract, you will have to do nothing at all, but access and view your data online. If we identify that the MeetH2O system is not transmitting data, we will act and check the status of the system on site. With our team of permanent field staff, we can take care of the maintenance of your MeetH2O system. We will perform small maintenance work on site at which we can directly verify the obtained data. In such, we guarantee the continuity of your groundwater level data.